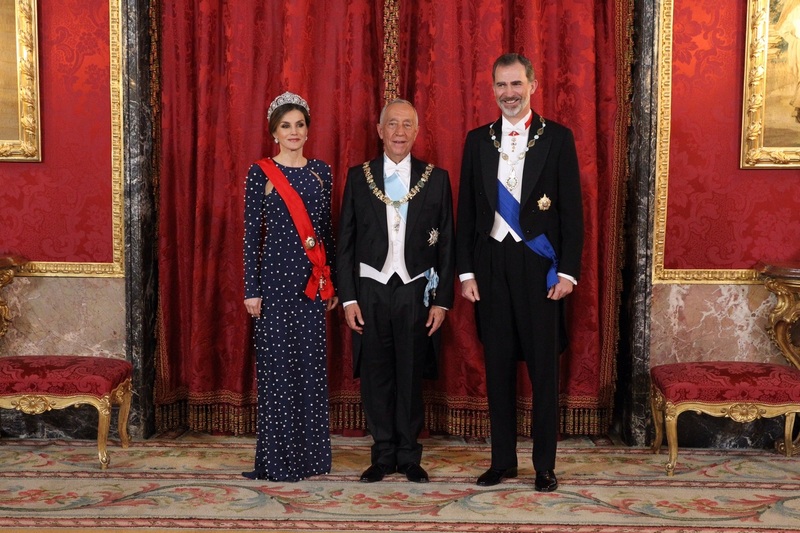 King Felipe and Queen Letizia of Spain offered a gala dinner in the honour of Portuguese President Rebelo de Sousa at the Palace of Zarzuela in Madrid. Delegates of both Spain and Portugal were in attendance for the dinner. 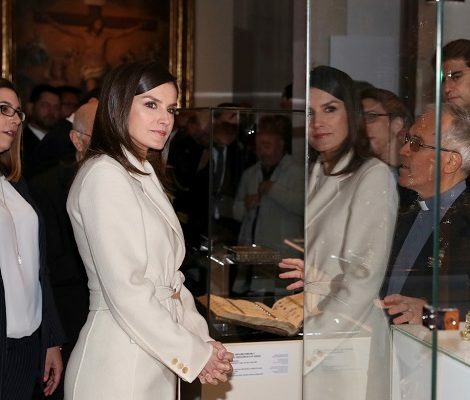 For the occasion as we expected Queen Letizia appeared in dazzling royal jewels. She chose a blue gown from Madrid based Spanish designer Ana Locking. The dress belongs to the designer’s Spring-Summer 2017 collection. 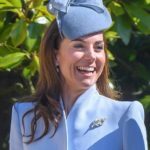 The blue gown is accentuated with pearls of different sizes and features cut outs at the armpits, sleeves and back with a thigh high slit. A closer look at the gown. 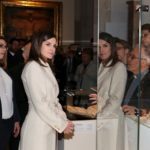 Tonight Letizia premiered another piece of royal jewel that we were waiting for her to wear. 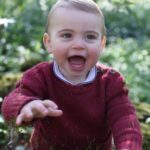 She wore Cartier Pearl and Diamond Tiara. Commissioned by the wife of King Alfonso XIII Victoria Eugenia in 1920 to the famous jewelry, has Egyptian motifs and is made with diamonds and seven large pearls. This tiara was pretty favorite of Queen Victoria Eugenia and passed down to the royal women as part of the royal jewelry. If I remember correctly last time we saw this tiara at the wedding of Crown Princess Victoria in 2010 worn by Infanta Cristina. Letizia paired the tiara with the “joyas de pasar” diamond and pearl earrings. 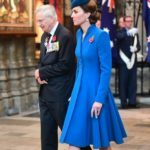 Giving regal tribute to the guest country Queen Letizia donned the Order of Christ (Portugal) sash.